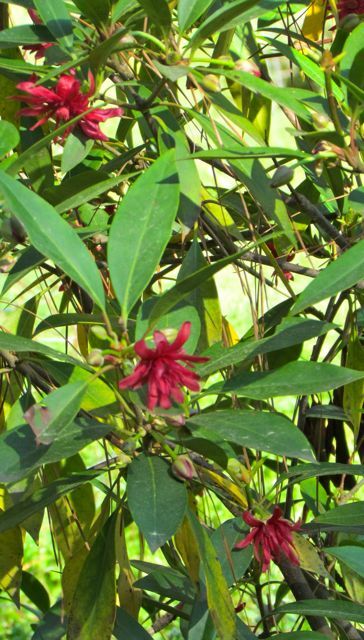 When I was looking for an interesting evergreen to screen my vegetable garden from the neighbors in an area mostly shaded by a large Loblolly Pine, I decided to try Florida Anise-tree (Illicium floridanum) because its spicy leaves are supposed to deter deer damage. In fact, this native of swamps of the deep south is poisonous to cattle. My neighborhood deer think my young shrubs are delicious, so much so, in fact, that I was forced to enclose them in wire cages. The deer are especially fond of the newly emerged tender leaves of spring, which, I suspect, contain lower amounts of toxins than fully mature leaves. I chose a named cultivar — ‘Halley’s Comet’ — because it’s supposed to flower in greater numbers and for a longer time than the species. The plants were not happy during their first two years within wire cages. Part of it may have been the cages — some plants do not like bumping into the wire; when they do, it seems to inhibit their branch growth. But I think my biggest problem was back-to-back significant drought years. When my shallow well for the garden runs dry — which it does most summers now — those shrubs only got what little water I could tote to them. Because they are native to shady swamps, they weren’t getting enough water to make them happy. However, when we put the deer fence around the vegetable garden earlier this year, we were able to enclose within its borders most of the Florda Anise-trees. Freed from their caged confinement, they are responding surprisingly rapidly to their release. For the first spring since we planted them, these little evergreens are jam-packed with deep crimson, starburst-shaped flowers that persist quite a while on the plant. And I can see many flower buds waiting their turn to open and prolong the show. The shrubs will supposedly grow six to eight feet tall. My tallest is about four feet high now. The evergreen leaves seem to get damaged by the cold every winter, so they look a bit bedraggled until new spring growth perks up the plants. I suspect they’d grow faster in a wetter spot, and I may move one down to a wet shady spot on my floodplain just to see how it responds — if I can figure out a way to protect it. When I ordered these trees, I also bought a Chinese Illicium species from the same nursery. Illicium henryi — Henry Anise-tree — seems to be faring better than the US native species, but is growing more slowly. I’ll keep you updated on its progress. I also bought a couple of Illicium floridanum ‘Alba’ plants. These look just like the species, only the flowers are a creamy white that really stands out against the evergreen foliage. I happened to plant these in deeper shade down the hill from the vegetables, and these shrubs are doing very well. I’ll show you what I mean another time. 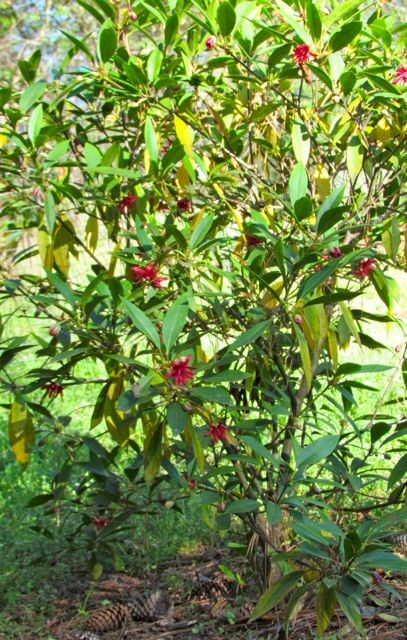 Bottom line: For shady, moist areas not severely impacted by deer predation, this evergreen, free-blooming shrub should be a welcome addition to any southeastern Piedmont landscape. This entry was posted on April 16, 2011, 10:24 am and is filed under Favorite Plants, piedmont gardening. You can follow any responses to this entry through RSS 2.0. You can leave a response, or trackback from your own site.